The Ivanti® Endpoint Manager and Endpoint Security, powered by Landesk inspector displays details about items in the Ivanti console. Use the inspector to quickly find information about managed devices, groups, queries, security configurations, and many more items. Inspectors are defined for many standard items. For example, you can inspect managed devices, scheduled tasks, vulnerabilities, and the core server. To view the inspector, a user must have the correct right assigned in Role-based administration. The Inspector right has only one option, View, that can be enabled for a user. If a user doesn't have this right, the Auto inspector and context-menu option for the inspector are not visible. For information about Role-based administration, see Role-based administration overview. Turn on the Auto inspector (click View > Auto inspect). This opens one window that displays data any time you click on an item. Each time you click another item, that item’s data appears in the Auto inspector window. Right-click an item and select Inspect. A new inspector window opens with data for that item. Inspector windows open separately from the console. You can resize the window to view data. You can act on some items, such as the list of processes running on a managed device. 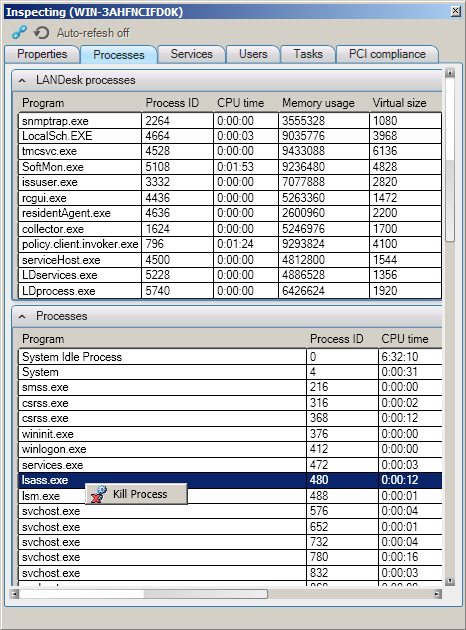 From the inspector window, you can click the Processes tab, right-click a process in the list, and kill the process. Similarly, you can stop or start services running on a device by clicking the Services tab and right-clicking a service in the list. Some data items in an inspector window are displayed as charts. To view the details of a chart, double-click on the chart. 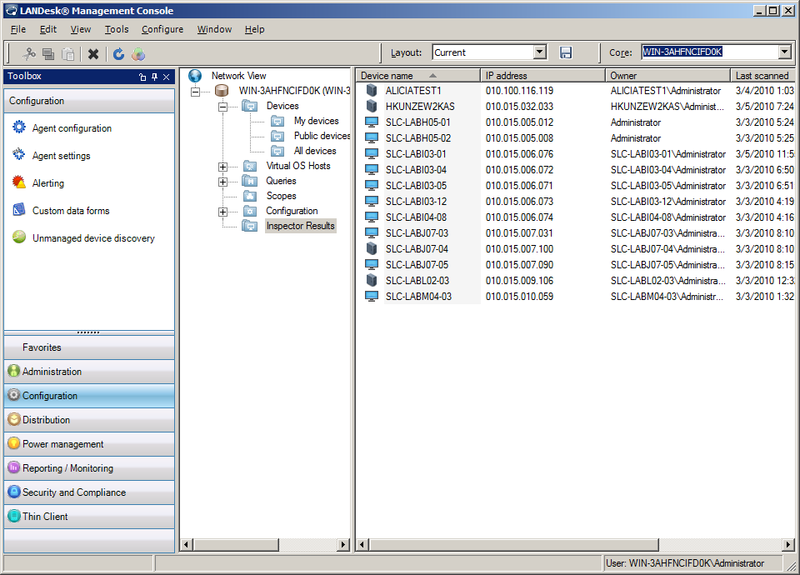 The data details are displayed in the network view in the Inspector results list. Each chart shows a summary of data when you point to a portion of the chart. Double-click the chart to view the associated data in list format. Viewing the results this way makes the data actionable. For example, in the Scheduled tasks inspector a chart can show how many devices have failed a task. 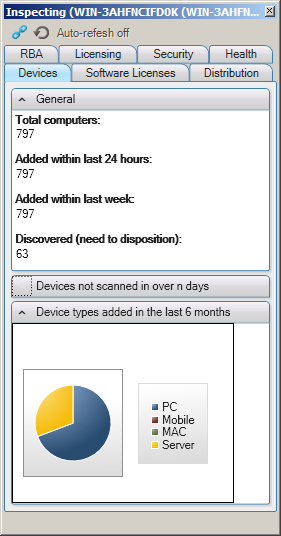 If you double-click the chart, you’ll see the individual devices listed in the Inspector results folder. You can then apply an action to those devices (such as restarting the task) or view a report with that data to follow up. Data in the Inspector results folder changes every time you double-click on a chart in an inspector window. 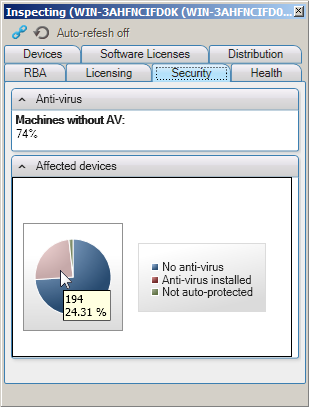 In the example above, you would click on the “No anti-virus” section of a chart to see a list of devices without an antivirus application. If you click the “Anti-virus installed” section of the chart, the list changes to display devices with an antivirus application. Some inspector data can be updated in real time. This can only happen if you have deployed a device agent that includes the Real-time inventory and monitoring component. 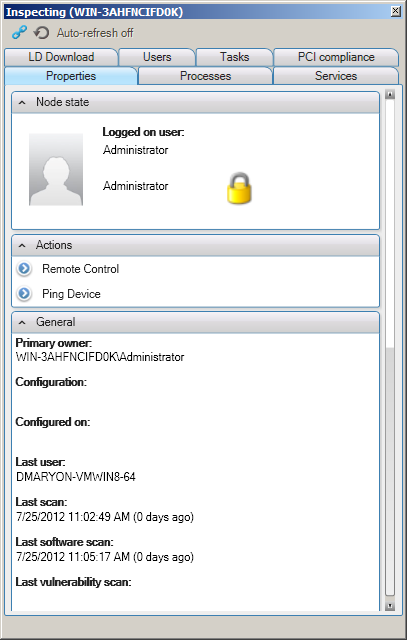 In the network view, right-click the device and select Properties. You can create an XML file that defines inspector parameters for items in the Ivanti Management Console. To do this, you’ll need to be familiar with XML conventions and you’ll need to understand how data is managed in the database your core server uses. For instructions on creating a custom inspector, see the "Creating a custom inspector" document in the Ivanti Community.